Optimum feeding management strategy should provide the proper amount and balance of feedstuffs and nutrient to all cows at the correct time to achieve high productivity and efficiency, optimum cow health and reproduction, and maximum profitability. The goal in any dairy project is to produce high milk yield very efficiently. To achieve this goal, we must fully control the production, and the best way to for doing it is by planning an intensive confined dairy farm, using the most advanced technologies exists in the industry. The objective of feeding management is to achieve and maintain high milk production is to maintain a proper balance of nutrients which minimizes fluctuations in the rumen, maximizes digestion, and ensures a steady flow of nutrients to the udder. Dairy cows eat 10-13 meals per day averaging about 20 min per meal when fed ad libitum (means free access to feed all day). If diets are balances nutritionally, this eating behavior provides relatively constant supply of nutrients to rumen. A properly balanced totally mixed ration (TMR) is a feeding method which helps achieve this goal. Use of TMRs is the most common method of feeding on most large dairy herds. Cow fed TMR are usually able to achieve and maintain higher DMI (Dry Matter Intake) in all different stages of the lactation period. 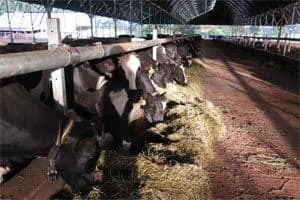 Feeding TMR ensures that cows consume desired proportions of forages when two or more forage is offered and ensure that cows consume desired amounts of forage in relation to amount of grain offered. The TMR allows for greater accuracy in diet formulation and feeding. When diets are formulated properly, adjusted frequently when moister (DM) and feedstuffs quality change, this system provides the opportunity to control nutrients provided to the cow accurately. In addition, weighing of feeds provides for inventory control feedstuffs. 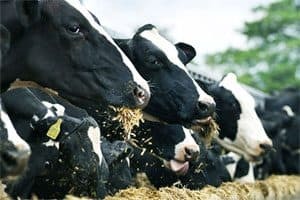 Use of TMR allows cows to eat more small meals of a balanced diet during a day which provide a more constant supply of nutrients to rumen microorganisms which lead to increase efficiency of energy and nutrient utilization. Optimum synchronization of protein and energy can be achieved more easily with TMR than when ingredients are fed separately. From feeding management point of view, we distinguish between two major types of animals in the dairy, cows and heifers. Cows feeding shall be divided for milking cows and dry cows, and heifers shall be divided to five different feeding groups per age. Each group should get the adequate feed ration per the nutritional requirement. Feed costs are nearly 60% of the total cost of milk production. To achieve high milk production with high economic efficiency the farm must have a feeding strategy. For that purpose, there is a need for guidance of professional nutritionist. The nutritionist should visit the farm at least 2-3 times a year to evaluate the performances and to reformulate the different feed rations according to the feed stuffs availability and the updated prices. Such effective routine can save costs and secure the profitability of the farm.